As our home (the Midwest) is the major hub for curling in the USA, our relationship with the sport may be less abstract as you think. We love curling and several of us play…that is, we try, but it’s harder than it looks. Our staff’s curling abilities were simply did not parallel the quality of our chocolate making abilities so we had to bring in some ringers. Red Elephant Chocolate proudly sponsors one of the best curling teams in the country, Team McCormick. 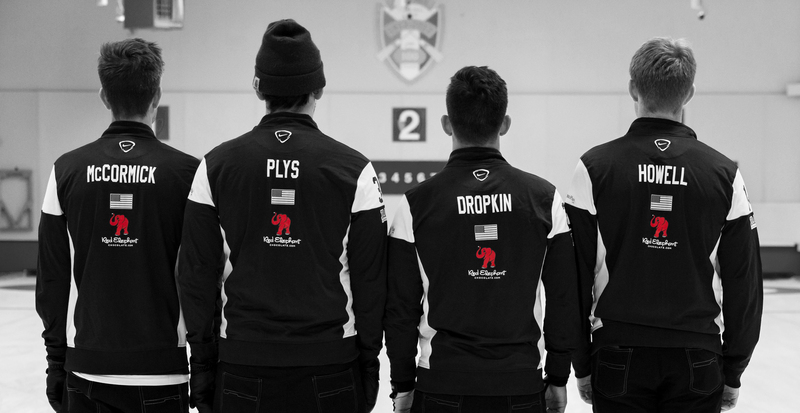 This season marks the second year that Red Elephant Chocolate has sponsored a high performance curling team. This year’s team is a balance of young talent blended with decades of experience that have their eyes on the 2018 Winter Olympics. For details on their schedule and updates on their road to the Olympics follow them on Twitter and Facebook. In further celebration of the one of the fastest growing sports in the world, Red Elephant Chocolate is offering two exclusive curling themed chocolate sets all hand crafted and made from premium dark and milk chocolates. Full House: 17 total pieces - 16 curling stone shaped chocolates (8 dark, 8 milk) in a box that looks like a house with our signature elephant chocolate on the button. Biter: 5 total pieces - 4 curling stone shaped chocolates in a box that looks like ¼ of a house with a signature elephant chocolate on the button. These sets are a limited edition and we cannot guarantee availability.